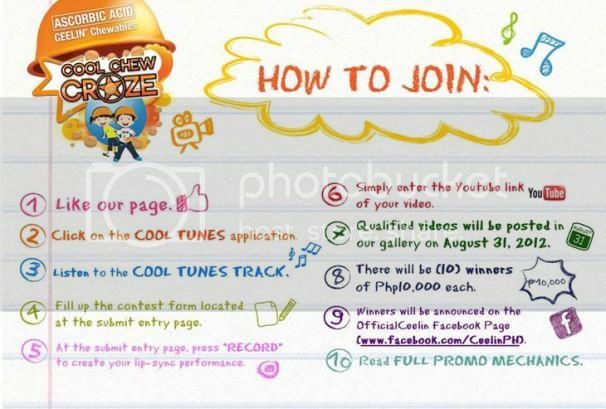 Join Ceelin Cool Chew Craze and Win Php10,000! Do you have 7- to 12-year-old kids who take ascorbic acid Ceelin Chewables and who love being in front of the camera? If you do, then let your kids join the Ceelin Cool Chew Craze for a chance to win Php10,000! The Ceelin Cool Chew Craze is an online video contest for children ages 7-12 years old. Your cool kids will create a video of themselves (with their parents’ approval and help of course!) lip-syncing to the tune of the Ceelin Cool Chew Song. They can jazz up their performance with some groovy moves and creative improvisation. Ten winners of Php10,000 each will be chosen. The best videos will also star in the Ceelin official video, together with a secret guest celebrity. You can watch the video mechanics here: http://www.youtube.com/watch?v=ETesJbE5Gcw&feature=plcp. To perfect your Cool Chew performance, you can also rehearse with the Ceelin Cool Chew Craze practice video here: http://www.youtube.com/watch?v=XAs_-Jqy5ZU&feature=plcp. Ceelin Chewables is an orange-flavored, Vitamin C tablet for children. A dose of Ceelin Chewable tablet every day enhances the kids’ immune system, increases their appetite and keeps sickness at bay, allowing them to enjoy more fun activities at home and in school. This entry was posted in Ceelin Cool Chew Craze, Online Video Contest. Bookmark the permalink.